People who know me would certainly never accuse me of being religious. However I'd watched “eat, pray, love” on the flight over, and if an ashram is good enough for Julia Roberts its good enough for me. I particularly remembered the scene where she fell asleep during chanting, and some wiseass told her sarcastically he's certain that's the first time its ever happened. I might have mentioned that I'd broken my hip and while I wasn't too hopeful of meeting Julia Roberts lookalikes I convinced myself that a bit of intensive yoga would be just what the bone doctor ordered. 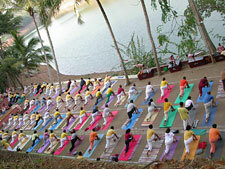 There's a well known ashram the Sivananda Yoga Vedanta Dhanwantari close to Trivandrum at Neyyar dam. They have what is called a yoga vacation which start on the 1st, and 16th of each month and runs for 2 weeks. I had a few days to get from Allepy to Neyyar dam and if I hadn't had enough of the backwaters, there's a boat that leaves at 10:30 and takes 8 hours to get to Kollan, but stops after 6 hours at Matha Amrithanandamayi Mission the ashram of one of India's few female gurus. 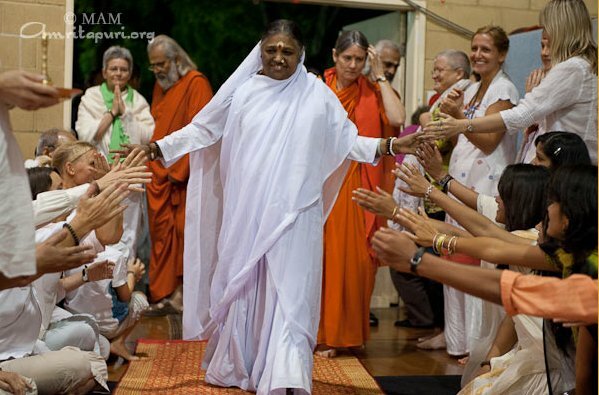 Amrithanandamayi also known as Amma (word for mother in almost any language) is famous for her hugs. I'm a bit of a hugger myself so maybe we'll find common ground. Amma tours the world holding marathon (16 hour) hugging sessions, with an army of helpers making sure all the pilgrims are lined up neatly in a production line of Darshan (the energy she imparts through her hugs). Actually my ex girlfriend was very into Amma, and I'd visited and been hugged by Amma three times in Munich, twice with the ex, and the last time I'd helped prepare the exhibition hall for her visit. I was on the electrical team, and got my first exposure to 3phase electricity. I wired up the field kitchen and the cooks pronounced themselves pleased with my efforts. I arrive at the Ashram to spend 2 nights, and find Amma is leaving the next day on a 2 week South Indian tour. Most of the westerners staying in the ashram are going with her. Apparently the Ashram can hold up to 2000 pilgrims and it will be much quieter when she's gone. After dinner there's chanting, and everybody is delighted when Amma turns up to lead the Bhajans. I have to admit she's an infectiously exuberant chantress. This ashram also offers a 2 week yoga course, however I have a strange feeling about this ashram. Although I've never been to an ashram, this place doesn't seem serious. Yoga, meditation and getting enlightened are all hard work, and there's no mood of people applying themselves seriously to that kind of stuff. It's not a "working ashram"
Apparently Amma agrees with me. I was told that the next morning after the chanting of the 1007 names for God at 04:30 on the beach, Amma went a bit Kali on her followers. Shiva is the God of destruction, and Kali is Shiva's female personality with a hangover, PMS, and generally bad attitude. 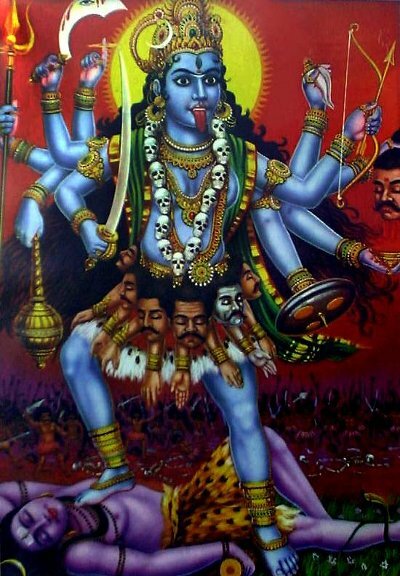 She likes a bit of sacrifice and blood does Kali, and Kali temples are messy affairs. According to Amma's biography she often exhibits God like personalities. Which is not only perfectly acceptable but expected of a living Goddess. She normally restricts herself to Krishna, Devi, and Durga who are all popular well behaved Gods, but if she's angry or frustrated out comes Kali. She told them that, reaching the higher planes takes application, and work and they would not get anywhere just by being around her. That's also the impression I got, a lot of the 1000+ pilgrims were there just hoping Amma's goodness would rub off on them. I'm honest, I was there because the boat stopped, and I hoped for a hug. 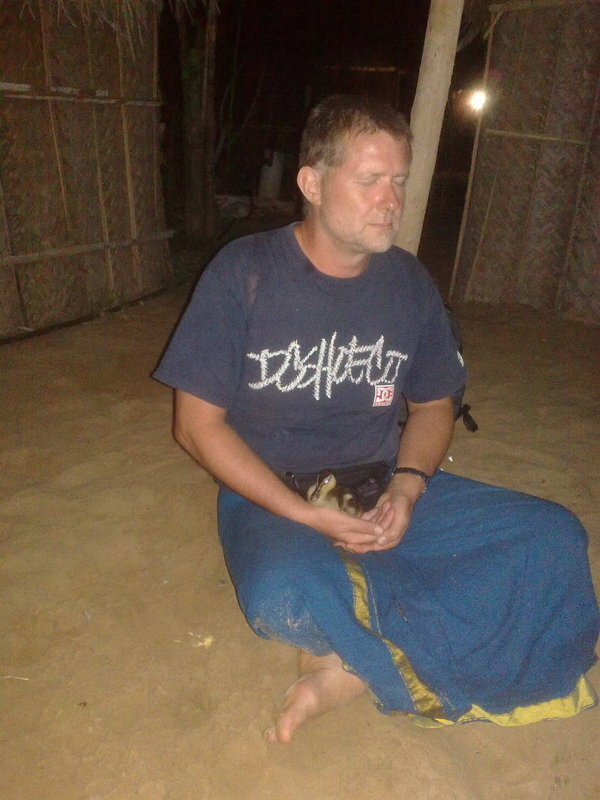 I got chatting to this German man who had spent 17 years on the quest for enlightenment. For such a seriously spiritual person he was rather cool, and shockingly frank. He explained to me all the ways the ashram is set up to grab money, and Amma is no different from all the other money hungry so called religious icons. I was a bit taken aback by this. If Amma is nasty and evil then surely there's no hope in this valley of misery we call life? So I ask him is she money grabbing because she's greedy, or because she wants to use her money to do good? Oh to do good of course he answers. All her charitable foundations need money to operate, and the more money she has, the more good she can do. So to help her do more good I bought an Amma doll for the ex. Hope it does her good too. Next day I watch 10 bus loads of Amma followers head off, a few hours later Amma makes her grand departure. If you stay at an ashram you're required to do some selfless service (even though you're paying to be there) I'm detailed to help wash the pots in the kitchen. There's a certain satisfaction in washing pots big enough, that you could chop me, and cook all of me in such a pot. Not a big as the pots loaded on the truck for the Amma tour. I could have slept in one of those pots. That night the bhajans were much less exuberant without Amma, and I left after 5 minutes. Its a long series of bus rides from Amma's ashram to the Sivananda ashram, and I arrive quite late in the evening. It forms an instantly strange impression. I expected a place of serenity and meditation. A yoga vacation has just finished, but they also have a teacher training course that lasts 4 weeks. The TTC are in the middle of a talent show. One man sings "You're in the ashram now" to the lyrics and tune of "You're in the army now". We also have a spirited rendition of "Welcome to the Sivananda Ashram" aka "Hotel California". Apparently this talent show every Saturday evening is the brain child of the founder who had this funny idea that enlightenment should be fun, and lively ...sometimes. 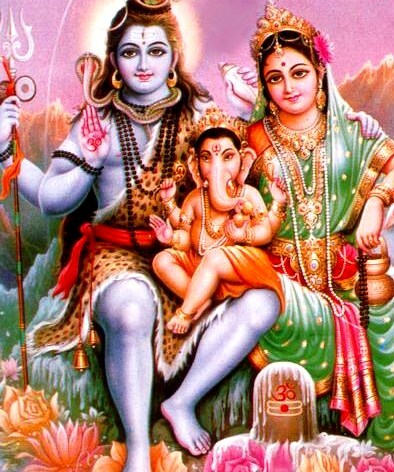 Shiva, Parvati & baby Ganesha. Funny I thought Ganesha was a young man when he got his elephant head? Next morning we walk up a mountain in darkness to watch the dawn. Dawn is greeted with a spot of chanting. The most used chant after “Om” is “Jaya Ganesha jaya Ganesha jaya Ganesha lakshima”. The next few lines go onto to implore mercy and benevolence from a few lesser Gods, but Ganesha is one of the most popular. He's got an elephant's head, is rather fat, very cheerful, and is revered for destroying obstacles. Ganesha is the son of Shiva the God of destruction, and Parvatti the beautiful. Apparently when Ganesha was about 2 years old, Shiva went for a stroll in the Himalayas; for about 20 years. When he came back Parvatti was taking a bath, and had asked Ganesha to guard the bath house. Shiva was of course keen to see his wife, and was taking no nonsense from the handsome young man guarding the bathhouse. So he just chopped his head off as destructive Gods tend to do. Parvatti was not pleased. That was our son Ganesha you idiot; she shrieked at Shiva. You better bring him back to life, or you're going to be one sorry God she threatened. So Shiva ran down to the valley and the first animal he saw was an elephant. He chopped off its head, stuck it on his son's lifeless body, did some Godly thing, and Ganesha was resurrected. With an elephant head, and possibly a phobia about bath houses. At the ashram I realized something about Hinduism. I was brought up Catholic, and was required to believe that God is some omnipotent, omniscient white bearded giant looking down, and saying “Ah Francis is saying his prayers, good, good”. “Ah he's going to mass, excellent I love mass”. Hindu's don't actually believe in blue skinned 10 armed God's of destruction, or elephant headed God's of endeavor. The believe that these represent the God's within themselves. And they don't chant to please the Gods, instead they believe that the chants are fundamental vibrations, and chanting opens a portal to your inner consciousness. Or something. Lecturer Really? But don't soundwaves travel through the sun? Lecturer And the sun is what form of matter? Me Well its a proton photon plasma. Lecturer And what did we find just after the big bang? but not a quark gluon one. How on earth do you know that? It is refreshing to have religion using science rather than fighting it however. One evening they showed us a video which made a welcome change from chanting. Even if I can admire the principle of chanting it, doesn't stop me being bored by it. The video was about a Japanese professor's experiments with water and it made me furious. I was already familiar with the subject. The professor froze water under various situations and examined the crystals. One of the most bizarre was that he was nice to one batch of water "nice good water etc", and mean to another "horrible nasty water". The crystals formed in the water treated nicely were radically different from the water he was mean to. Needless to say the crystals of the happy water looked nicer too. Personally I believe that water is strange stuff, and was fascinated by the material. So what made me furious? They started off by saying that our planet was unique in the universe in that it supported life. How can they know that, we've only been discovering exo planets for about 10 years? They also said that water was unique in that its solid form i.e. ice was less dense that its liquid form so ice floated. This is very important for life as otherwise lakes would freeze solid. They went on to say that science didn't understand why water behaves like this. This point hit me hard, because while at school in science class I asked our science teacher, a rather crusty old priest why water expanded on freezing. His answer was that the Almighty made it so that aquatic life could survive. I was rather hoping for a chemical not theological explanation in a Science class. Anyway water is not unique, to quote Wikipedia: Other substances that expand on freezing are silicon, gallium, germanium, antimony, bismuth, plutonium and other compounds that form spacious crystal lattices with tetrahedral coordination. My colleagues on the enlightenment quest asked me why I was so mad, and when I explained they asked wasn't I splitting hairs? No I spluttered, I'm sympathetic to the whole subject matter, but if I showed this video to friends back home, the scientific absurdities would be an excuse to ignore the interesting subject matter and only discuss how wrong the science was. Likewise when I talk about energy healing, and the life force, I'll be subjected to a lecture that energy is measured in joules, and force in newtons, and they neither has anything to do with life, and please cease insulting my audience by using bad science. I've discovered chi as an excellent word for life force that scientific types can't complain out. But the main point of this ashram visit was yoga. Beginners had their yoga in the mornings down by the lake, and we were entertained by the sound of the lions in the sanctuary roaring on the other side of the lake. I wasn't the oldest, or the fattest doing the yoga, but I was one of the worst. Not of course that yoga is a competition. However 95% of the class got into a shoulder stand, and half the class into a head stand. I got into neither, my biggest achievement was holding the crow for 5 seconds. Funny that most of the yoga postures are named after animals: scorpion, locust, down dog, cow, calf etc. At one of the talent show evenings two young Indian lads gave a yoga demonstration that would have put the best in our class, and the instructors to shame. Such flexibility can't be natural and the two were great show men. I think they got the biggest cheer of all the acts. It was like a bunch of white belt karate students watching 2 black belts give a demonstration. After two weeks our class started drifting off, it was actually scary leaving the ashram its easy to get institutionalised. Your meals are all arranged, your day is planned, the outside world is a dangerous place with too much choice. Happy meditation and yoga. Been planning such a stay in India for a long time so I'm envious. However, I go to the Sivananda centre and others in Munich and am presently doing 2 yoga courses and trying to rent out my apartment so I'm busy. Looking forward to the next blog. Hi there, I noted this update on the ashram. I envy your trip and follow with interest. Please come to Holzkirchen to visit when you get back to Germany. A trip to India to do exactly what you are doing was on my list in 2000. I went to Mongolia instead - visited the Gandan Monastery in Ulan Bataar whilst there - I've spent a lot of time visiting monasteries in Asia. I find them amazing places. Somewhere near you must be a second hand bookshop for novels travellers read on those long 20 rupee bus journeys. If you ever come across two wonderful books "A Journey in Ladakh" by Andrew Harvey and "Ancient Futures" by Helena Norberg Hodge they are inspiring reads, and may lead you to the roof of the world, Leh in Ladakh whose scenery and people may blow your mind! Good luck with the travels. J.
where can i find pictures of young gods meditading ? We are celebrating Ganesh Puja Festival since last 19 years and ceomittmd for regular celebration in future. We celebrate this festival in Yamuna Nagar (Haryana) and it is becoming famous day by day. We are proud that we have started first this festival in Yamuna Nagar and even in Haryana and now only in Yamuna Nagar 6 or 7 groups are celebrating every year this festival in Yamuna Nagar with us. We thank God Ganesha and pray always for prosperity and good time in future also.